Here’s a post from the archives, originally published in 2010. There are delicious fresh local melons still available just about everywhere, including in my garden, so I thought the timing was right for this simple little salad to make another appearance. I bought a delicious Crenshaw melon at the Farmer’s Market on Saturday and after eating a few slices for breakfast yesterday morning, decided to turn the rest of it into melon balls. I had no particular reason for wanting to do this, it just seemed like a fun thing to do. And we all know that food tastes better when it’s cut into fun shapes, right? As I was scooping out the flesh with the antique melon baller that has been in my family for as long as I can remember, I thought about the half-empty container of fresh mini mozzarella balls in the refrigerator. I had never combined melon with mozzarella before, but the melon balls and mozzarella balls were the same size and shape and the more I thought about it, the more it seemed like they were destined to end up in the same bowl. So of course they did end up in the same bowl. I made a quick dressing of lime juice, honey, and mint since I knew those ingredients would be nice with the melon. I also added a bit of crushed red pepper because after living in Sicily for four years I now put crushed red pepper in just about everything. And of course a tiny bit of salt always helps to perk things up a bit (try a sprinkle of salt on fresh cantaloupe – yum!). The resulting salad was light, simple, and delicious! For those of you who are dairy free (which I am at the moment), this salad would be delicious even without the mozzarella. For variety and some extra color, try mixing more than one type of melon. Put melon balls and mozzarella in a medium bowl. In a small bowl, whisk together honey, lime juice, mint, salt, and crushed red pepper. Pour dressing over the melon and mozzarella then toss to combine. Serve immediately. That sounds perfect right about now!! 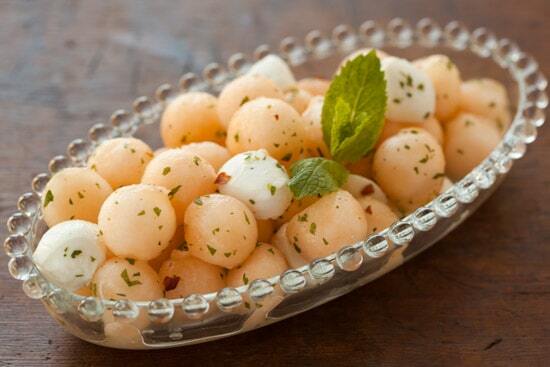 I've done an appetizer for years that has melon balls (whatever tastes the best - honeydew, cantoloupe, crenshaws, etc.) the mini mozzarella balls and a similar dressing - thread them on small skewers - pretty, easy and oh so tasty!! They are also good with a little prosciutto threaded on the skewer!! I am really enjoying reading your blog - so glad I found it through Summerfest 2010!!! WOW! This looks amazing, can't wait to give it a try! This sounds absolutely refreshing. I love the idea of hot pepper with melon (and I'm a huge fan of Crenshaws), and a bit of salt. Lovely. This looks nice and light. Cute serving dish, too! This sound so light and refreshing!!! I too love red pepper flakes!! Thanks for the post! I was walking thru my favorite market tonight and could help but pick up more melon than I needed... The thought of summer being over makes me sad. I also picked up 3 new bottles of olive oil- can't wait to eat my melon with some salt and olive oil... LOVE the dish with the melon, so perfect! love, love, love it! this salad looks and sounds gorgeous. Can't wait for it to warm up down here and i'm definitely making it. thanks! So clever! As I sit here and sweat in my office due to the blazing heat of DC, I want this. That looks amazing and so pretty! :) What a great idea! Looks so yummy! Will have to pick up some melons at the Farmer's Market this weekend and give it a try! Luv this idea for melon and mozzarella! (Has anyone else noticed how good melon has been this summer???) Also luv the use of mint! So Summer! I am really loving fruit and cheese salads this summer. I just made a watermelon and feta salad recently. This looks like a great one. Just lovely. Those flavors sound so fun to pair together. I am going to have to try this one soon! I have suscribed to you blog on my I pad via the "blog shelf app" and I love it. The screen makes your pictures and food look so tastey and beautiful. Thanks for your posts. Keep them coming. Hey...It looks gorgeous. I made it today and we loved it. I think next time I am going to skip on Cheese because it does not go well with watermelon. Other than that it was simply heaven :)And I love your blog too. I am starting mine soon too. Hi Nicole! Just stumbled upon your blog, and well you got my attention with the recipe name ;) mozzarella and melon? that's not very typical, but you make it sound delish, somehow! I can't wait to read more on your upcoming posts. Thanks for sharing! What a gorgeous dish! (The contents of the dish are gorgeous, too) Love the picture and can't wait to try the recipe. Thanks! How simple but gorgeous! I bet this would go really well served with duck prosciutto, just sayin', YUM!